Oh my love, how I look forward to seeing your beautiful face, and your big chin, on the big screen again. And in person! 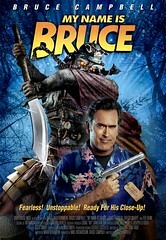 The glorious Bruce Campbell will be in Minneapolis introducing six screenings of his new movie, My Name is Bruce on December 5th, 6th and 7th. Squeeeee! If you’re too young to know him as Evil Dead’s Ash Williams, you may know him as Sam from the USA Network’s Burn Notice. But there’s so much B-Movie greatness in between. This entry was posted by sharyn	on Saturday, November 1st, 2008 at 6:51 pm and is filed under issues. You can follow any responses to this entry through the RSS 2.0 feed. You can leave a response, or trackback from your own site. I have so much love for Bruce Campbell– I can’t wait for the new movie, which I’ve been eagerly anticipating for about a year! Awesome! And for some reason, I totally missed that he’s in Burn Notice. Shame on me! Did you see Bruce on Best Week Ever this week? No! I haven’t got teevee, but I’ll have to find the clip online somewhere. Love that man. So much.